Have you ever wondered how an integration between a third party company and Matomo (Piwik) is possible? What are the key factors for a good partnership? This article describes our recent collaboration with a company for a mobile messaging integration. At Matomo (Piwik), we are always looking for new functionalities to build and improve the work of our community members. 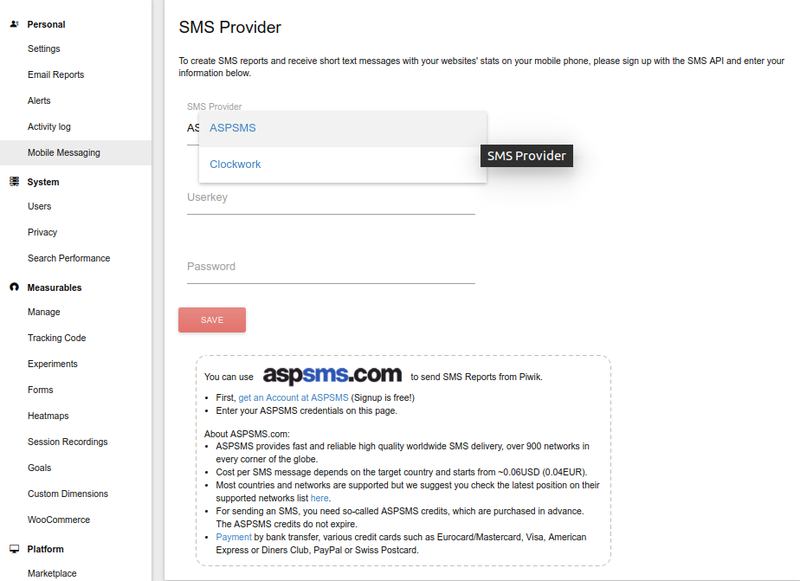 ASPSMS, an innovative SMS Gateway & Messaging solutions provider got in contact with us in order to do just this. Why did we decide to partner with ASPSMS? Those three words define the collaboration we had with ASPSMS and in the end everyone benefits. Using the ASPSMS integration, you can receive a daily or weekly SMS message listing the Key Performance Indicators of your website(s). As a company, how can I contribute to Matomo? If, like ASPSMS, you are providing great services which can help Matomo (Piwik) final users take better decisions, do not hesitate to contact the Matomo core team. You can also start to develop your own, specific plugins, that you can freely publish on the Matomo (Piwik) marketplace. VADIAN.NET AG is today one of the leading global providers of SMS solutions with more than 200,000 satisfied business clients. The product ASPSMS was launched in 2001. ASPSMS is a product of VADIAN.NET AG, a Swiss based Internet and Mobile Solutions provider.